KoopaTV: The Nintendo Switch Is The Anti-CIA Console! By LUDWIG VON KOOPA - There's no built-in microphone hardware! Two weeks ago, on March 7, WikiLeaks revealed Part 1 of the Vault 7 series (there's no Part 2 yet) — an information dump detailing the Central Intelligence Agency's (CIA's) often-rumoured-but-unconfirmed capabilities. I wrote a (true) story about one of them: Remote vehicle hacking, which can be used for undetectable assassinations. But there's a lot more, with their Embedded Device Branch and Mobile Devices Branch turning your electronic devices with microphones into covert listening devices. Gaming consoles, huh? Hey, one of those JUST came out from Nintendo earlier this month. The Nintendo Switch! Did the CIA take over the Nintendo Switch? There's an audio jack where you can connect commercially available microphones. 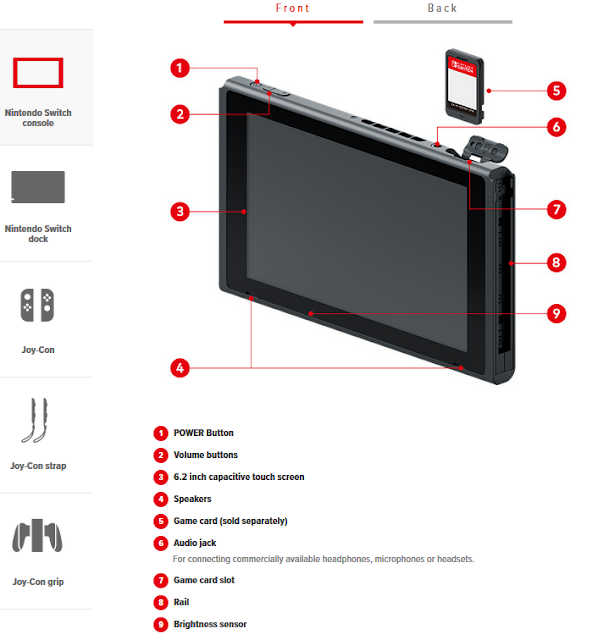 Compare to the Wii U GamePad specifications, which state that there is an included microphone. This bucks Nintendo trends going back for over a decade since the Nintendo DS, which had an internal microphone that we used for voice-chatting in Pokémon Diamond and Pearl. Since the Nintendo Switch also doesn't have Miiverse or even an Internet browser, the CIA and NSA also cannot spy on your activities there like they were doing before. This all comes with a major caveat: Because the Nintendo Switch bucks recent Nintendo trends and lacks an internal microphone, AND the Nintendo Switch lacks connectivity and Internet features in general, there has to be some way for users to be able to access those things. After all, they're standards in today's gaming world. Therefore, Nintendo is outsourcing all of those capabilities to a mobile app on the smartphones that, as revealed in the opening, have already been cracked by the CIA. Ludwig doesn't own a smartphone because he's paranoid and hates the idea of one. There's a wealth of information that he possesses that the CIA would be interested in, and he assumes that they're listening in on his Wii U and 3DS activities, systems that have internal microphones. They must enjoy how angry he can get when playing Super Smash Bros. For the Wii U on For Glory Teams. Keep in mind that since the CIA lost the technology, any hacking outfit can use it now. Ludwig doesn't use Skype for a similar reason, especially since Skype is designed for suckers to be spied on by the NSA. The FBI and NSA would previously try to access your older gaming consoles. But there'll be nothing to access on the Switch! However, the right Joy-Con has an IR Camera. It's possible that that alone can compromise our privacy... but you have to actually develop software for the camera. I don't even know what the IR Camera does. Hubby preordered me a Gamestop Switch bundle so going to have my Switch by next week. I would miss the Testfire but oh well. Now let's so if I can make it past the first screen of BotW without baby crying. Yeah the bundle has so many unnecessary items but reports from other buyers say that since the items are itemized on the order form I can return the ones I do not want separately. The only game in the must preorder in-store Gamestop bundle is BotW along with its season pass but it comes with a strategy guide and headphone set that I definitely will go to return. Also there is a carrying case but I might keep that. If that headphone set has a microphone, get rid of it! ...Though, normal headphones can also still be converted into listening devices. Thanks to you typing "THE BABY" in a previous post, I was inspired to choose Samus as my profile icon. Hope I can write a short profile blurb "THE BABY" underneath the profile pic. I have not research that aspect of the Switch. I guess I like some surprises out of the box. Dat ain't a kid or a squid. Samus or Zero Suit Samus? The strategy guide was sold out so they are giving me a gift card instead. Got the head set and got a return slip with it so wish me luck that I can successfully return the headset. Good luck with the headset!